Hydraulic Book Press TBP-II with two independent stations with fixed Pile Height upto 400mm. The printed title can be pasted on open book or board to board size up to 810x525mm with single Platen & day-light area upto 400mm. The press can be used either in Manual or Auto-Mode with each station alternatively or together, resetting to loading position after pre-set time. The option to set time on a Digital Timer in Seconds (from 001 to 999). The option available for use are : Independent control through separate switch for left and right hand side Platens through SELECTOR position No.1..
By selecting the 2nd position, the stations (platens) will operate in tandem to a pre-set duration in Auto-mode.. In SELECTOR position �1 & 2� both the Platens will move up simultaneously with combined force of 12000 kgs. 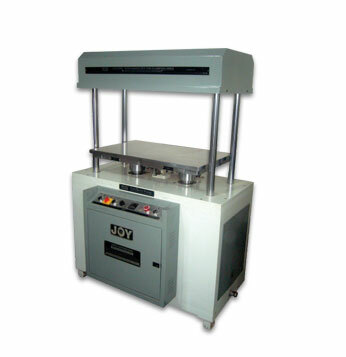 Single Platen supplied for pressing Books, Account Ledgers, Book cases & Boards etc. of large formats.. Hydraulic system is based on 2 HP Power Pack and pressing force adjustable upto 6000 kgs on each station..
Conveniently located Control Panel. Castors are provided for maximum space utilisation.